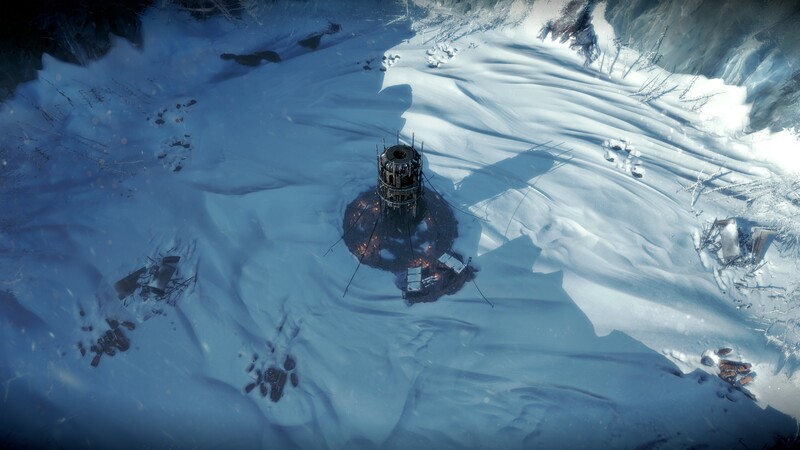 Few times have I finished a game and been left feeling so heartbroken as with Frostpunk, the city-building survival game from 11 bit Studios that envelops you in a blanket of frost and asks you to lead your people to survival…if they let you. Day one! Pristine snow. Lovely. I’ve twice been cast aside by the inhabitants of the last city on Earth, the first time was justified, but the second time? When we were so close? That one hurts. For a city-building game to bring out deep emotions shows you that Frostpunk is a game to take a second look at. The year is nebulous, but everything feels like a late 19th Century steampunk civilisation coming undone by the very technology that drove them forward. Nations have been decimated by cataclysmic climate change with the British Empire retreating to the Arctic to try and survive. You take charge of a small band of survivors, huddled around a generator, what will become their lifeblood as the climate gets colder, looking to you as their Captain to guide them through perilous times. You might well make some drastic mistakes when you first play the game. 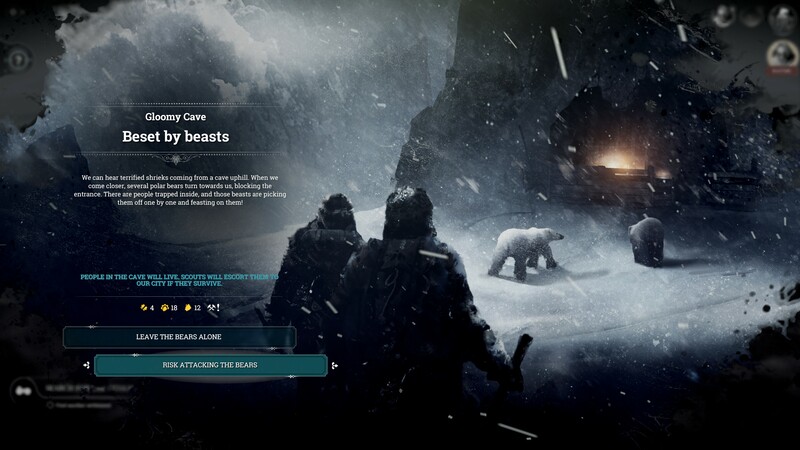 I’m disinclined to lay the blame at the tutorial, this is after all a survival game, so there is an expectation that you will figure things out for yourself. My early mistakes were in not understanding how roads work in the game. They can be built in any direction from the generation, and any building needs to be connected by a road to function. Yes, you can send your people to pick up coal by trudging through the snow, but building a road and a gathering post is warmer and more efficient. But of course, your people need somewhere to live! It’s all well and good having enough coal to start up the generator, but without tents to protect them from the cold, your people will soon start to fall ill…and die…and then the corpses will fill the streets. Do you want to be bad, or bad? That’s how my first playthrough started off, and ultimately left me in a cycle of rising discontent and falling hope that I failed to escape. Having lost so many of my people in the early hours of the game, I was never able to truly manage the resource juggling act that you have to perform to keep the city running. Coal to power the generator, wood and steel to construct the essential buildings, food to keep people’s bellies full. The cold and starving conditions will soon leave people ill, without some skilled hands operating the medical posts, they will get ever worse, until the bodies start piling up in the streets. It’s then that a weary citizen makes their voice heard, asking you to help clear the corpses. At this point, discontent was rising, and the faction of Londoners were causing trouble. To try and recover some semblance of control over my people, I let them have funeral processions to bury the dead. This would raise the hope of the poor souls, but also meant people were spending days on end burying those I so carelessly let pass away. What they weren’t doing was working. With the cold biting, and food stocks running low, the Londoners who wanted to leave my frozen den of solitude and search for New London, became ever more restless. Bears! There are many choices to make outside the city. 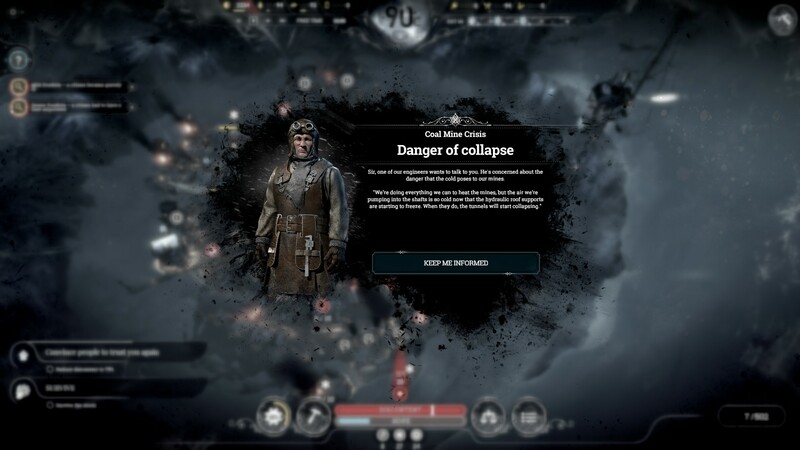 As you progress, Frostpunk lets you pass a variety of laws. Everyone can pass laws under the Adaptation title. This might allow you to keep children out of the workforce (yay!) or spread out the food rations by introducing soup (boo!). The Adaptation laws are very all well and good, but when the Londoners start to cause mischief, you need to exert more influence over your people. Order or Faith are your choices, but I sadly they feel too similar in their ultimate ambitions. Both have routes to quell discontent or raise hope, it depends on whether you prefer to do it under the guise of being a hard-taskmaster, or religious fanatic. 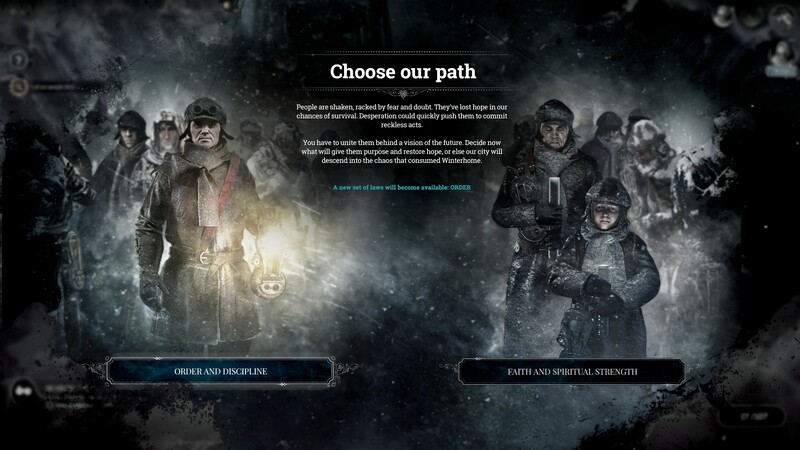 I would have wanted Frostpunk to offer something entirely different…democracy! Regardless, in my first playthrough, my bobbies on the beat failed to keep the Londoners in check, and with rising discontent, I was banished. Learning from my first test, I returned to the game and got off to a much better start. I kept my people fed, warm and healthy. I sent scouting parties to explore the wilderness, finding essential supplies and more survivors to put to work. I instilled a sense of religious purpose to keep people feeling positive, and I avoided, until the end, making people work 24-hour shifts in the frozen coal mines. Day 31 and my city is bustling, unaware of the coming doom. Having overcome the initial difficulties of starting my city, and quelling the troublesome Londoners, I enjoyed a peaceful mid-game. My people were happy, automatons were taking away some of the burden of work, and I was able to get the disabled back down the pits thanks to prosthetics. Things were going well…until the Great Storm approached. With temperatures set to fall to horrendous lows, I set about researching all the generator upgrades I could. I ensured everyone had a nicely insulated house. I worked my people in the coal mines and sawmills as hard as I could. I failed to stockpile enough food. When the storm hit, the food soon ran out. People became sick. My infirmaries couldn’t cope with the numbers. I had to sacrifice people in the mines to keep the coal coming. I reasoned that people would rather wait a few days for food, than to freeze as they worked. Perhaps my incessant cries of “MINE! Mine that coal damn you! For 24-hours you won’t stop!” were to blame. But with the storm about to blow past, my time had come. Cast out I was, and I left my people to freeze. The mines! The mines! Oh lord the mines! If the cold-hearted light of day, I’m not sure whether the spike in difficulty in the end-game is balanced quite right. Your citizens know the Great Storm is coming, hope was still high…I thought they would have stuck by my wisdom and seen it through. I was wrong, and I don’t think I will return to the main scenario again. Having come so close, I don’t want to put myself through that pain again, especially not when I know what the different options with laws and exploration will lead to. However, there are other scenarios that I will sink my teeth into. You might find that you will go back, time and time again, to the A New Home scenario that forms the core of the game. For me, I won’t be doing that without some changes to the different paths you can take. But the other scenarios will keep me interested in the game for some time, and the developers are promising to work on balance improvements, new game modes and new scenarios. 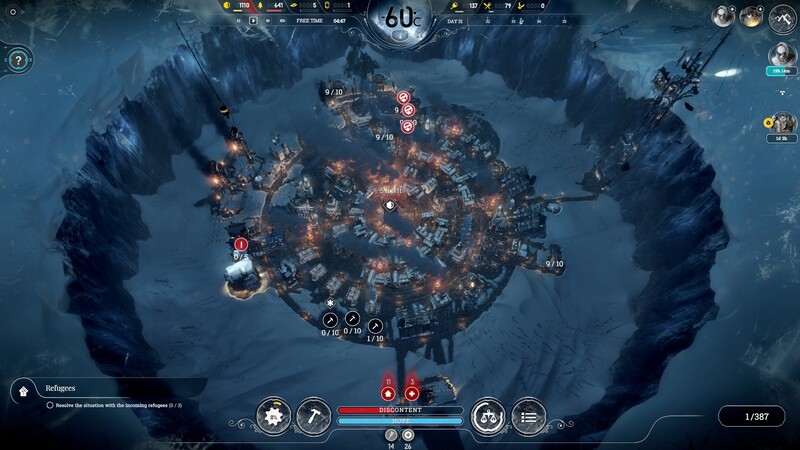 If you haven’t taken a closer look at Frostpunk yet, I implore you to do so. It is a city builder that everyone should play. For more on our review policy, please head here. Review based on Steam media account.